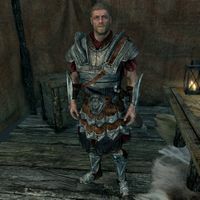 Legate Hrollod is a Nord soldier commanding the Eastmarch Imperial Camp. He spends all his time in the camp and is not hostile toward you, unless you spend too long in the camp and aren't a member of the Imperial Legion. Should the Legion win the war by taking Windhelm and killing Ulfric Stormcloak, Hrollod will take up the place of Yrsarald Thrice-Pierced in the court of the new Jarl, Brunwulf Free-Winter at the Palace of the Kings. Hrollod wears Imperial armor with matching boots and bracers. He wields an Imperial sword and a steel dagger. For ranged combat, he carries an Imperial bow. He carries a number of steel arrows and his sleep outfit, a belted tunic. This page was last modified on 30 December 2013, at 13:21.